After careful consideration and evaluation of the countless requests and movements regarding scoring methods for Cowboy Action Shooting™, the SASS Board of Directors do hereby decree that effective immediately, all SASS Sanctioned Cowboy Action Shooting™ matches are to be scored using Total Time. A direct email has been sent to all Club contacts, SASS Sanctioned match directors, and event organizers giving notice to this effect and requiring immediate changes to match planning to accommodate the change. SASS Sanctioned matches will no longer be allowed to use any other scoring method. We feel strongly that this monumental change will garner great support and appreciation from you- our valued members. Great job Misty, Wild Bunch and Crew!! I always feel like you all hear us!! Keep up the great work! Thank you,. thank you, thank you Wild Bunch! This is the very BEST of news! Thanks Misty. Hopefully, how to score an SDQ will be addressed. Making the "reccomendation" in the existing rules the rule would be nice. Thanks for listening Misty & WB. Really? If that don't beat all. Now what the he** are we going to argue about? You state "Cowboy Action Shooting." Any impact on "Wild Bunch" matches? Wild Bunch has totally different system. Time + misses + penalties. Best time for stage that day got 100 points. Then points awarded based on a percentage of how much slower you were. If you were 80% as fast, you get 80 points. Most points win. Isn't it 30 seconds plus however many targets on the stage times 5? But nobody gets heated up about those, cept maybe Bisley Joe for those of us long enough of tooth to remember that stain in the saddle. Interests:Cowboy action and horse back riding with my wife. Great decision! This will please most of the CAS shooters. Thanks to Texas Jack Daniels for the great presentation he made at the EOT TG meeting and to the SASS Board of Directors for reconsidering this option. SASS scoring program may need to be updated to handle ties or does handle it already for Total Time ties? Well, we could now argue about the WB scoring system! Thank you Wild Bunch ! All of the matches I've been involved in used RP or TT. WR and EOT is the only place I've seen this scoring system used. And all of the local matches have been allowed to use TT for ever, just State and above SASS Sanctioned matches REQUIRED RP's. I can't speak for others but I know that the Texas State WB match has used the official scoring method since it's inception. But this is all beside the point. I was just pointing out to Ozark Shark that this ruling would have no effect on WB because RP were never the mandated scoring system for SASS sanctioned matches. SDQ's will be as the maximum amount of misses on the stage plus 30 seconds. Not a fan! Never was! This will create more separation on paper and in spirit between the top shooters and the rest of the pack! But that's just my 2 cents. Most shooters really didn't know this was something that was even up for change. Sometimes change takes time. But like all great organizations, SASS listened to their customers and did what needed to be done. Thanks to one and all. In the end here's my study, I run the Westshore Posse and one I got home and entered the match by total rank and by total time and the pecking order was pretty close to being the same in match finish. The bottom line is that imho most shooters will stay within their normal finishing order ar matches. 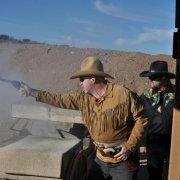 Never knock the fast shooters, become one or accept what it is you want out of shooting cowboy matches. I have informed the "locals" of this decision, we have been using TT at our local matches for 8+ years, SDQ all target misses + 30 seconds! But did they? or did they just listen to those that yelled the loudest? I like how it always goes to, "Never knock the fast shooters." This hurts me way less than others! And there are plenty it hurts way less than me! But its easier to figure out that the total number of shooters capable of winning a big match was at least cut in half! Also you can't just look at scores from a RP match, change it to total time and say, "See it didn't change much!" The way you play the game changes at a TT match is different than RP. Upon reflection, sadness usually occurs when an Era ends. Old Timer's tales is all that remains. As evolution keeps marching on. And the younger replace the older.